The technical work of BF includes working groups dealing with “Warm Edge”, “Bonding”, “Safety Glass”, “Systems Inside Cavity” and “Curved Glass”. Its job is above all to define technical standards for assuring product quality. In addition, working groups within BF devise appropriate guides and guidelines, for example on handling multiple-sheet insulating glass and on the use of triple-pane thermal insulation glass. BF works closely and amicably with other associations in the window industry and with professionals on other technical projects. For example, the “Richtlinie zur Beurteilung der visuellen Qualität von Glas für das Bauwesen” (guideline for assessment of the visual quality of glass for the construction industry) was written as a joint effort. On national and international standardization committees, BF represents the interests of its member companies, initiating research projects on issues relevant to the industry, for example on sustainability and the Environmental Product Declaration, on thermal insulation during the summer, on the emission behaviour of windows or on the durability of insulating glazing in bonded window systems. At the political level, BF is closely involved in the drafting of energy-saving regulations. With future energy-saving regulations in mind, it supports efforts for solar gain and summertime thermal insulation to be taken into consideration. In the interests of the flat glass industry, it was able to help prevent the planned reduction in the permissible solar input, which would have resulted in smaller glass surfaces in buildings. For future changes in energy-saving regulations, BF is working closely with eminent scientists to create models that take sufficient account of free-of-charge solar energy and daylight gains through glass and windows. BF has advocated from the very start a changeover to triple-pane heat-insulated glass as the standard product of tomorrow, while giving the political world the message that its members are in a position to achieve this changeover in production. The important topic of energy-efficient modernization of buildings with glass and windows is being jointly promoted with many contact persons both in the realm of politics and in other associations; BF is a member of the working group on buildings in the BDI (Federation of German Industries) and a central partner for discussion of these issues with the relevant federal ministries. 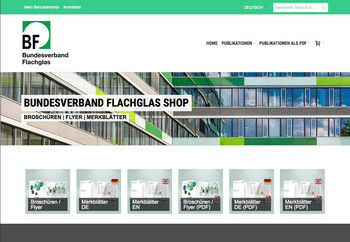 BF’s public relations work informs both end users and the trade press about the products and services of the flat glass industry. To do so, BF issues press releases and brochures, publishes a monthly newsletter for its members, and offers information for energy consultants relating to the topics of glass and windows. With its “Energiesparen mit Glas” initiative, a Germany-wide campaign of the entire glass industry, the replacement of obsolete glazing units such as uncoated insulating glass and single glass by modern thermal insulation glass is being promoted. As part of that initiative, BF attends trade fairs, show and informative events; it also provides many of its partner companies in the professional trades all over Germany with information and advertising materials, enabling them to promote energy-efficient modernisation of glass and windows in their own locations. BF organizes symposiums on current topics in the industry, where the participating and the supporting members can become actively involved. It offers technical product training courses. All in all, BF’s policy is geared to offering its members benefits wherever a common approach strengthens them. It therefore takes on all those jobs which the member companies cannot handle themselves at all (representation of political interests) or where the harnessing of their activities in a higher-level and neutral institution affords advantages (work on standards, general public relations work).